Mode of occurrence: Large irregular or flattish nodules. 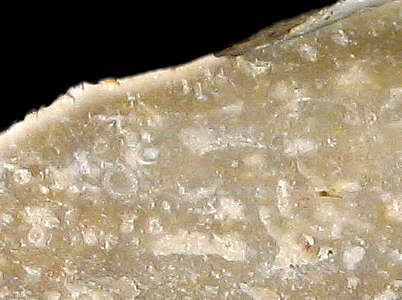 Cortex: Thin, worn and smooth, to very rough and pitted, brownish yellow, transition sharp. Colour: Greyish brown to light brownish grey (2.5Y 5.5/2). Pattern: Alignments of white millimetric specks, occasional mottling on some of the samples. Appearance: Lacks homogeneity (bursts into small pieces), dull, semi-opaque, rough, coarse to medium-grained. Grains: 25 to 30 %, pale, subangular with low to high sphericity (bryozoan sections), large-sized (1 to 5 mm). Grain composition: Mainly large colonial and ramified bryozoans, a few fragments of echinoderms and pelecypods. Geographical description: The sampling-site is located directly adjacent to a narrow road, a bit over a kilometre to the (S)SW of Poncin. Co-ordinate precision: As the site is a few hectares in size, precision is not of the highest importance, but the coordinates lie well within the area. The geographical coordinates point to a spot near the centre of the site. The location can be found on the 1:25 000 topographical map sheet 3230 W of the French Institut Géographique National. Geology: The material from this site can be classified as surface-collected flint or in eroded gulleys, Chenavel sector, clays-with-flint of various geological origins (Early and Late Cretaceous); Unit S (Rs). Other types of flint: Besides the Campanian CN4b material, several types of Late Cretaceous material can be found here (CN1a, CN2a, CN2c, CN4a, and CN6), as well as Early Cretaceous Ht3 flint. Geology: The site is located on fluvio-glacial deposits from the Würm I and II stages (units agl a-b on the geological map), in contact with Aquitanian sediments (Early Miocene, unit ml). This results in a mix of Upper Cretaceous an Cenozoic flints being present at this site. The CN4a type can be dated to the Campanian. Other types of flint: As so often on secondary sites, quite a lot of other types of flint can be found here, mostly of Late Cretaceous age: CN2b, CN4a, CN4c, as well as the Cenozoic "silex lacustre" of the T1 type.